At the corner of 15th & Platte streets there’s a cafe called Paul’s Place, where my brother Jack used to be bartender before he joined the army, because of this I frequented the place occasionally & consequently have a small bill run up, I believe I owe them about 3 or 4 dollars. If you happen to be in that vicinity please drop in & pay it, will you? I see Phillip Wylie has written another book, “Night Unto Night” supposedly as good as “Generation of Vipers”. Peter Arno also has a new collection of cartoons out, “Man in a shower” its called. They have the Harvard Classics up here, the five foot shelf of books, I’ve read about 2 feet of it, very nice, I especially enjoy Voltaire & Bacon (Francis). The football season up here has been a flop. We started out with grand plans; the guards told us if we looked good enough we would go to Salida to play & perhaps one or two other games on the out, but no go. However, I understand the basketball team may get to play some local highschools. Since the days are getting shorter, because of winter’s approach, we get up at 5 o’clock now, instead of 4 as we had been; banker’s hours, huh? I’ve been here 2 months today (the 23rd), how time does fly. Please excuse the penmanship, as I can only see out of one eye; this morning I took the cows out to pasture, but on the way they ran out of the road into the corn field. The jackass I was riding couldn’t run fast enough to head them, so I jumped off & started to tie him to a barbed wire fence so I could chase the cows on foot. Just as I had tied the reins to the wire he jerked so hard it pulled a staple out of the fence post and into my left eye. It gorged a chunk out of my eyeball, but luckily failed to hit the cornea. I may lost that eye. 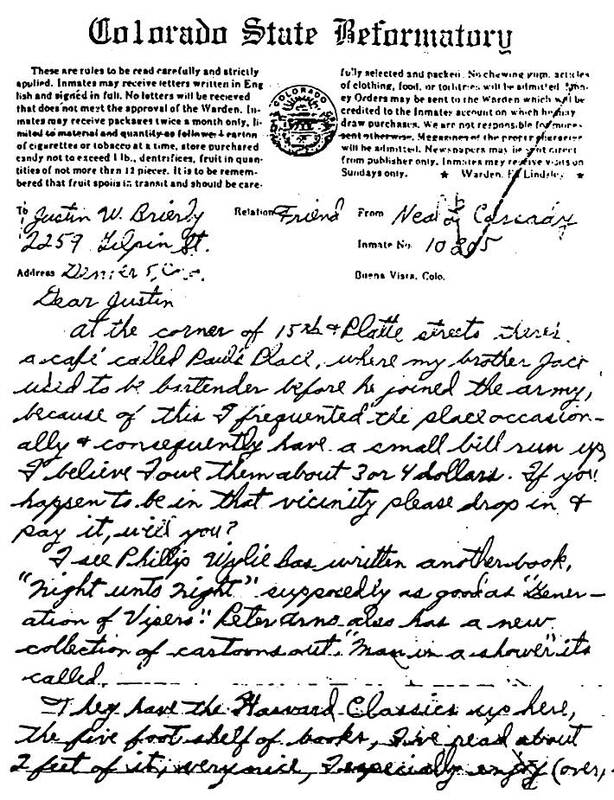 Neal Cassady’s earliest surviving letters were written to his benefactor, Justin Brierly, while Neal was incarcerated in the Colorado State Reformatory at the age of 18. In the letter of October 23, 1944 he speaks of “Paul’s Place” at the corner of 15th and Platte Streets in Denver. Paul’s Place is now “My Brother’s Bar”. 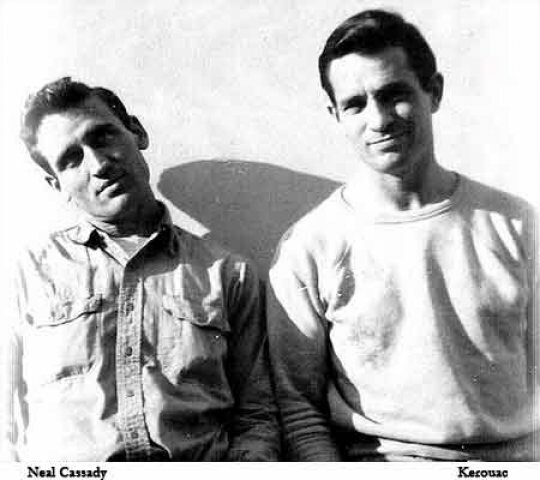 Neal Cassady was the inspiration for the character of Dean Moriarty in Jack Kerouac’s “On The Road”. He went on to feature in the lives of Allen Ginsberg, Ken Kesey, Tom Wolfe, and Hunter S. Thompson. A video of Neal Cassady’s Denver Years is now in production. Find out more on kickstarter.